Olympus has announced its $399.99 Stylus SH-2 with Raw capture, a 24x zoom lens, 5-axis image stabilization, built-in WiFi, 1080/60p video and Nightscape Modes packed into a compact, pocketable design. The SH-2 also features Olympus' Live Guide, which lets you adjust color saturation, color tone and brightness via sliders on the 3.0-inch, high resolution (460K dots) touch screen. Available in either a black or silver finish, the design of the compact body emulates the Olympus PEN series. The top panel and main controls are made from aluminum alloy. The 16-megapixel BSI CMOS 1/2.3" sensor is matche to a TruePic VII image processor. The 24x optical zoom lens has a range of 25mm to 600mm in 35mm equivalents. Super Macro mode fixes focal length to 11.9mm while focusing at 1.2 inches. Aperture ranges from f3 to f8.7 at wide angle and f6.9 to f20 at telephoto. Motion blur in low light shots is eliminated, the company said, with 5-axis image stabilization and Nightsape mode. ISO ranges from 125 to 6400 plus a High setting. Shutter speeds range from 1/4 second to 1/2000 second. Night scene goes as long a 4 seconds while Manual mode can stretch to 30 seconds. WiFi syncs with iOS or Android devices by scanning a QR code displayed on the camera's 3.0-inch LCD. Supported WiFi functions include image and video transfers, instant sharing and remote shooting (zoom, self-timer, white balance and exposure (ISO, shutter speed, aperture), shooting and drive modes, AF area, and shutter). Advanced Movie modes include Full HD 1080p at up to 60 frames per second, High-Speed Movie stretches scenes in slow (120 fps) or super-slow motion (240 fps) and Time Lapse Movie compresses up to five hours of action into a 20-second time-lapse video. Audio is captured with the built-in stereo microphones. Photo in Movie allows you to shoot still shots -- including Raw images -- while recording 1080p video. The SH-2 will be available in Black and Silver next month at an estimated street price of $399.99. B&H has listed the SH-2 for preorder. CENTER VALLEY, Pa. -- Olympus introduces a successor model in the Stylus SH line of digital cameras, the Olympus Stylus SH-2, featuring a 24x wide-angle optical zoom lens, built-in WiFi connectivity for remote shooting and sharing with a smart device, Raw capture capability and 5-Axis Image Stabilization that supports both still image and video capture. This sophisticated camera also adds new Nightscape Modes for stunning night scenes and portraits. The Stylus SH-2 reflects the premium aesthetic of the renowned Olympus PEN series of cameras. The SH-2's top panel and main controls are constructed of aluminum alloy, with superior craftsmanship that is reflected in every detail of the camera, including the lens barrel, dials and front and rear grips. The camera is available with two finishes: silver for a classic camera feel and black for an elegant monotone look. Despite its compact size, the Olympus Stylus SH-2 captures excellent image quality with its 16-megapixel sensor and 24x optical zoom lens, which adjusts from 25mm wide-angle to 600mm telephoto. This camera is also equipped with tele-macro functionality that allows you to capture stunning detail from a distance of up to 40 cm (15.75 inches), perfect for shooting macro images in a variety of settings. Nightscape Modes allow the user to select from different sub-modes to shoot beautiful night scenes, cityscapes and star trails. Pressing the movie button while in Nightscape Mode records video with gradation optimized for night scenes. Night + Portrait mode captures flash-illuminated portraits against a dimly-lit background. Night Scene mode uses an extended shutter speed to capture additional light from low-light scenes for bright, vivid images, without the use of a tripod. Fireworks mode expertly shoots high-contrast images from the dark sky. Last but not least, Live Composite and Hand-Held Starlight modes extract the brightest areas from a sequence of interval shots and combine them into one perfectly exposed image. 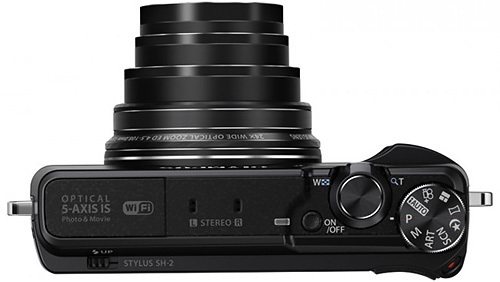 The Stylus SH-2 uses a sophisticated image stabilization mechanism, adopted from the Olympus OM-D E-M1, as a base for the camera's integrated 5-Axis Image Stabilization. Combined with the new Nightscape Modes, this system eliminates motion blur that tends to occur when shooting in low light, to deliver crisp, clear images. In addition, 5-Axis Image Stabilization compensates for camera movement that may occur when recording video while walking, rivalling the performance of the latest video cameras. Configuring the built-in WiFi is a breeze. Sync an iOS or Android smart device by quickly scanning the QR code displayed on the camera's 3.0-inch high-resolution 460,000-dot touch LCD monitor. After that, the SH-2's WiFi connectivity supports wireless image and video transfers, instant sharing and remote shooting. The Olympus Stylus SH-2 is equipped with Advanced Movie Modes for powerful video recording functions, including Full HD 1080p captured at up to 60 frames per second for smooth motion playback of fast action footage. High-Speed Movie stretches scenes in slow (120 fps) or super-slow motion (240 fps), while Time Lapse Movie compresses up to five hours of action into a 20-second time-lapse video. Photo in Movie allows users to shoot still shots -- including Raw images -- while recording 1080p video, perfect for times when you won't have a second chance to capture the shot. 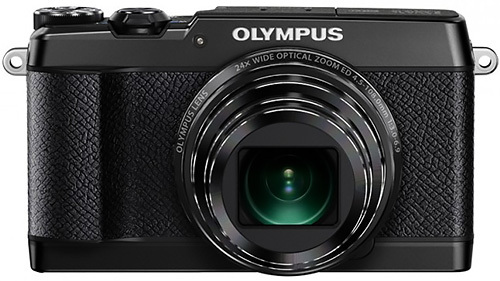 The Olympus Stylus SH-2 will be available in Black and Silver in April at an estimated street price of $399.99.